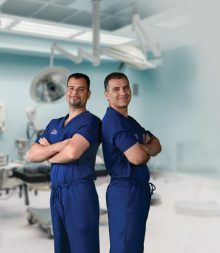 Kourosh Tavanaiepour, D.O., left, specializes in complex spine surgery and Daryoush Tavanaiepour, M.D., specializes in skull base surgery. Kourosh Tavanaiepour, D.O., has always seen Daryoush Tavanaiepour, M.D., as more than a big brother. From their days as young children in eastern Pennsylvania, Daryoush also took on the role of father figure and mentor to Kourosh, who was trying to find his passion in life. Both siblings ultimately chose the medical route and became specialized neurosurgeons. 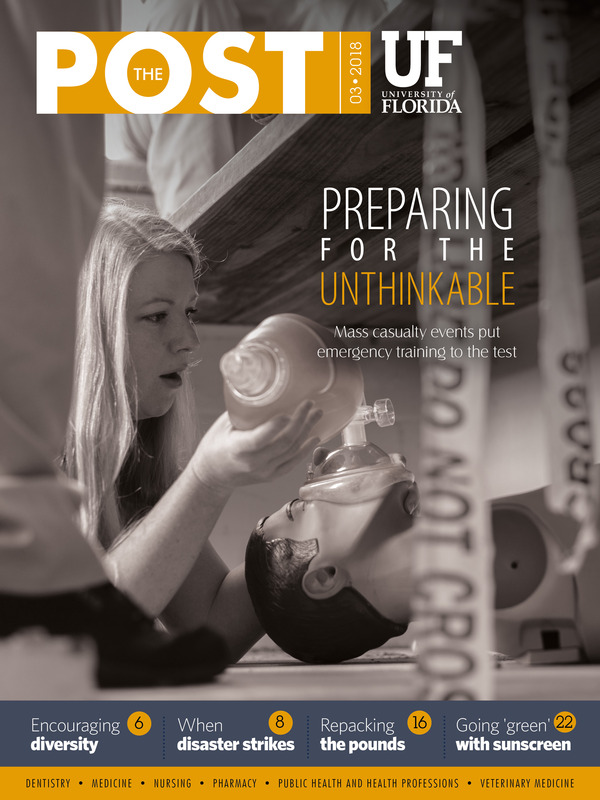 After spending several years apart, they are now reunited, using their expertise to treat high-risk patients with compassion at UF Health Jacksonville. Kourosh, who specializes in complex spine surgery, joined the neurosurgery team in 2017 after completing his fellowship at the University of Pittsburgh Medical Center. He saw UF Health Jacksonville as an attractive destination, largely because of its Level I trauma center and diverse patient population. He admits the warm weather didn’t hurt, especially since he had lived in the Northeast all of his life. For more than a year, Daryoush has worked with his colleagues and senior leaders to develop a comprehensive spine center and was in search of a specialist to help guide those efforts. The center, which is set to launch this year, will be housed at UF Health North. The center will be a one-stop shop for people dealing with deformities, tumors, traumatic injuries and other issues affecting the spine. Daryoush, the department’s interim chair, said the center will offer “all of the modalities under one umbrella,” with services to also include pain management, rehabilitation and neurological care. Kourosh smiles as he thinks back to his childhood growing up with his mother and brother, who is nine years older. As a single parent who worked multiple jobs, their mother often relied on Daryoush to keep an eye on Kourosh. The Tavanaiepours struggled financially and culturally; their mother immigrated to the United States from Iran in search of better opportunities. In the midst of the hardships, education was always emphasized. “Ultimately, I got interested in the brain and how it works and interacts with the mind,” Daryoush said. Years later, he didn’t initially support his brother’s desire to also become a neurosurgeon. Daryoush warned him that with the amount of commitment and challenges the job entails, you must have a true love for it. Otherwise, you won’t last. Kourosh said his brother inspired him to explore the neurosciences. In doing so, he realized it “just instantly clicked” for him and was something he found comfort and joy in. Though they lived apart for many years — even in different countries, as Daryoush completed medical school in New Zealand — the Tavanaiepour brothers always remained in close contact. These days, they both sport white coats emblazoned with the UF Health logo, more commonality to go along with striking similarities in facial features, height and skin tone. The family ties are easy to spot. During downtime in Jacksonville, the siblings joke and laugh like close pals. There are plenty of smiles and fist bumps during their get-togethers as the two shoot the breeze about their favorite TV show characters, fashion and much more. There’s a strong brotherhood that has only strengthened with time. Daryoush speaks of how he and his brother don’t allow the personal connection to adversely affect their professional activity or negatively impact the strong camaraderie that exists among all the department faculty members. Additionally, guidelines and agreements are in place that remove conflicts of interest and even the perception of such conflicts. For instance, Kourosh doesn’t report to Daryoush regarding administrative matters such as salary and performance.